Not only is this funny In it’s most basic use (in the movie theater during the quiet between trailers for example) and while the SNEAK ATTACK is a great way to cause mischief at the restaurant table while you’re away for a moment, the fact that you can make a recording of anything and trigger it with this app, and on a time delay, and over Bluetooth, makes this a much more versatile comedy app. 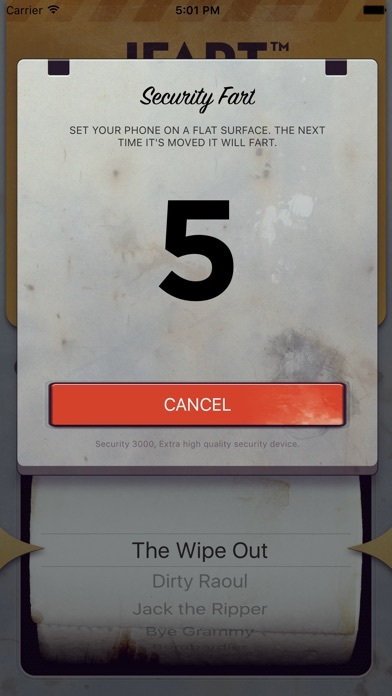 An important achievement in the history of iOS. This app is a greater achievement than the iPhone’s contributions to health, medicine, and society as a whole...iFart tops them all. I would like to see an update that takes advantage of the iPhone X’s screen though...and perhaps a facial recognition fart feature. I saw a vid on YouTube and it was “10 Bad Ideas That People Made Millions”. It's half-assed. The sound quality is crappy; and not in the good way. Worked for a while, then quit. No sound (which is pretty much all a fart is on an iPhone). Re-installed, re-booted; nothing makes it work. Waste of money and time. This app is freaking hilarious and I can't wait to pull a Brown Mosquito on my friends... Best fart app yet! Got it to play jokes on old friends. It does not work. I guess the joke is on me. How do I re-install purchased packs that I lost when I switched over to the IPhone 5? Look the sneak attack feature and the dinosaur farts! Works great on my iphone but I just got an ipad and none of the extras I paid for will install on it, it keeps telling me there's no secure connection even though the wi-fi is turned on and I'm sitting next to the wi-fi hub. I'm disappointed in this! I had an early version many phones ago. Happy to have this crucial and improved phone functionality. 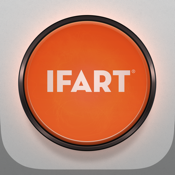 Fart apps have improved a lot since their infancy. My 4th grade son loves the fart songs and I even have to pry my phone away from my jr high school aged daughter. 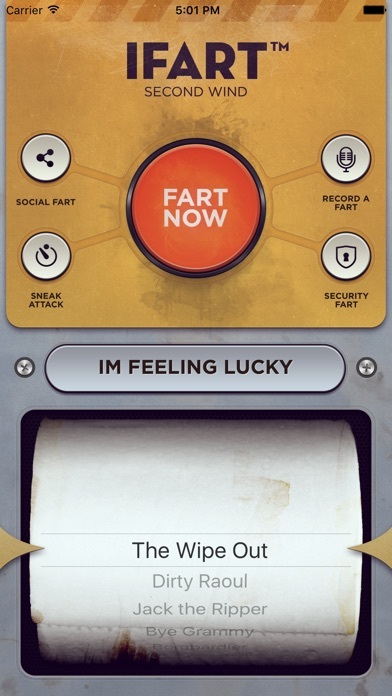 I agree that a fart messaging system would be a welcome addition. Well done guys. I had a lot of fun with this app but it isnt optimized for iphone 5... Why???? Jan 27, 2015....the crap locks up! You can't do anything on it. Save your .99 or it on something that actually works! So many laughs I have lost count!! 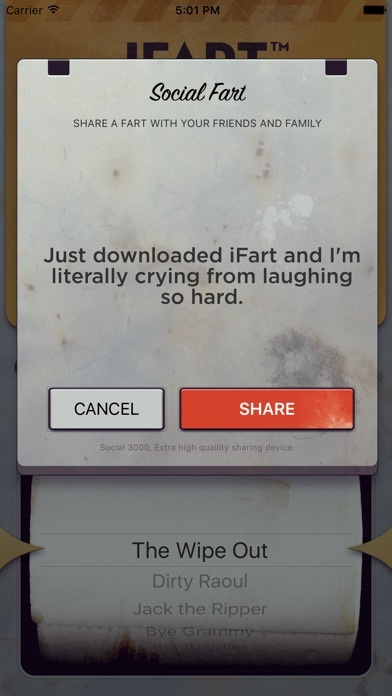 My kids love to fart and the love this app!! I crap my pants...ouch! I attempted to send a "mobilefart" entitled "Little tooter boy" on Christmas Eve to my girlfriend. We are not able to spend the holidays togeather and thought it would bring us closer over the holidays. It took her to a website.. And it did not play.. iFart Ruined Christmas! All of us 8-year-olds (even those who are that plus 50) can get a kick out of this. The variations are so much better than the old version (which I bought when it first came out). Definitely worth it! I've had so much fun with this app. I've heard of silent but deadly, but this is ridiculous! Please fix the sound on this app! the old ifart allowed you to sneak attack another ifart user by sending it from app to app through a user name and it was funnier way. bring thay option back! I had this app on my iPhone 3G and loved it! Thought about it just recently and PAID for it again for my iPhone 5... only to find out it doesn't work. There is no sound, no matter what. Tried rebooting, syncing, backing up and restoring... still doesn't work! Can this be fixed?!? Yesterday?!?!?! Two thumbs down! 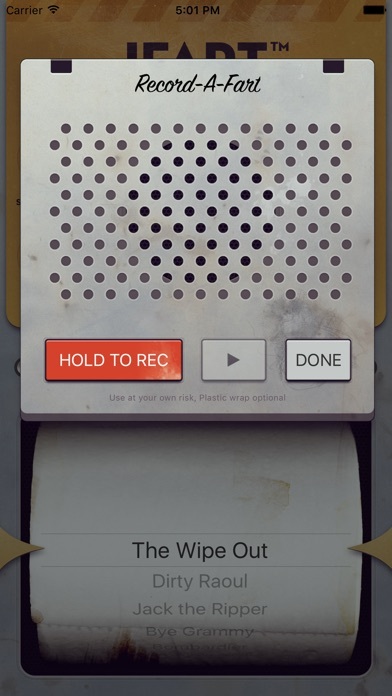 I love this app, but only ONE thing wrong - the silent but deadly should be Silent but SMELLY instead. I laugh like a hyena every time I use this app. Farts are funny! WOWED into a Fart! LOVE THE AIR! Love the fresh AirFarts...storm trooping by... Every FART...imaginable stepped Up! Blueschinaman comment. Finally! A functional, entertaining iPhone app! I have had hours of fun with this app, even got my boss with the security fart. It's just good dirty fun. When you enter social fart or any of the other optional features, you can't get out of the screen and return to the main iFart screen. I have gotten lots of laughs from this app! The new "presidential fart pack" is a riot. Great to see this classic app back in action! Really funny app. Good app to prank somebody with or just at random. Get this app now. I want to text my friends a fart noise. I want them to open the text and a fart noise happens. I will change my review if I can text a fart noise. Had a blast at work with this. Laugh so hard!!! My favorite app!! Maybe 10 year old boys are on to something. Great fun. Cannot wait to use it around family at Thanksgiving. I put a Bluetooth speaker in the Christmas tree and played this app at a large Christmas party we had. No one could figure it out. This old lady kept looking for the fart sounds in the try, but others assumed she was relieving herself every time she went over to the tree. Hilarious!! Sounds real.